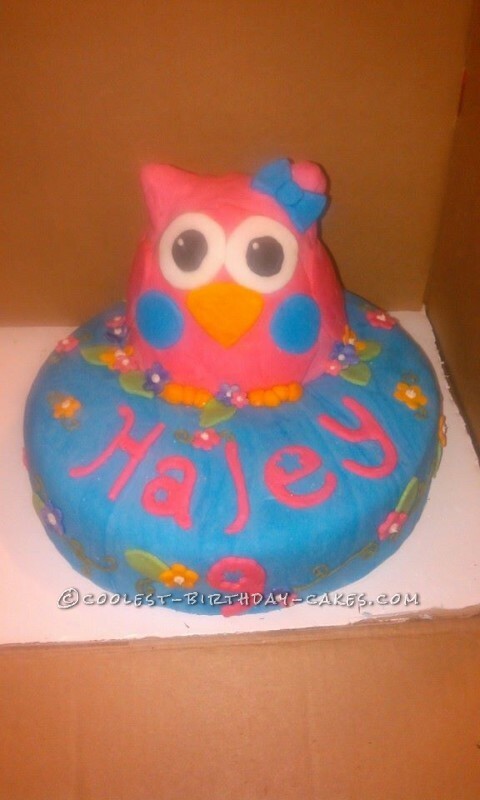 It all started with a request from my sister-in-law to make an owl cake for her 9 year old daughter, Haley. She gave me a picture she found on Pinterest and told me exactly how she wanted it to look. I wanted to make it my own but I wanted it to look similar to the picture she gave me. I made Marshmallow fondant from a recipe I found on the internet. I thought it would be smart to make it the day before and store it in the fridge overnight. 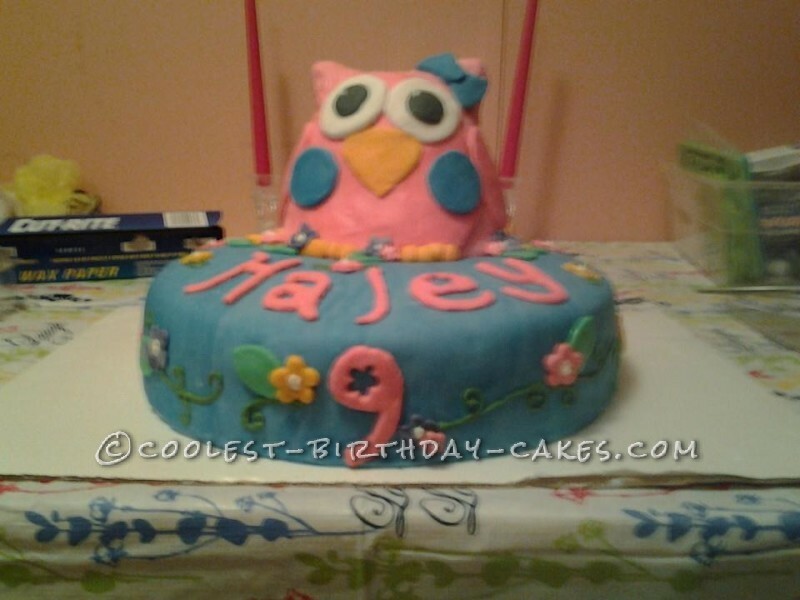 I also made a big Rice Krispy treat and shaped it into an owl the night before as well. The next day I began around 12:00 p.m. I figured it would not take long to make. After baking the two 12 in round cakes I began with the fondant, which was hard as a rock. I was able to get two of the colors that I made to become soft enough to use. Then of course I had to make more to replace what I threw away. That took another trip to the store. I finally got to decorate the owl and I felt very proud of myself. I thought it was cute. 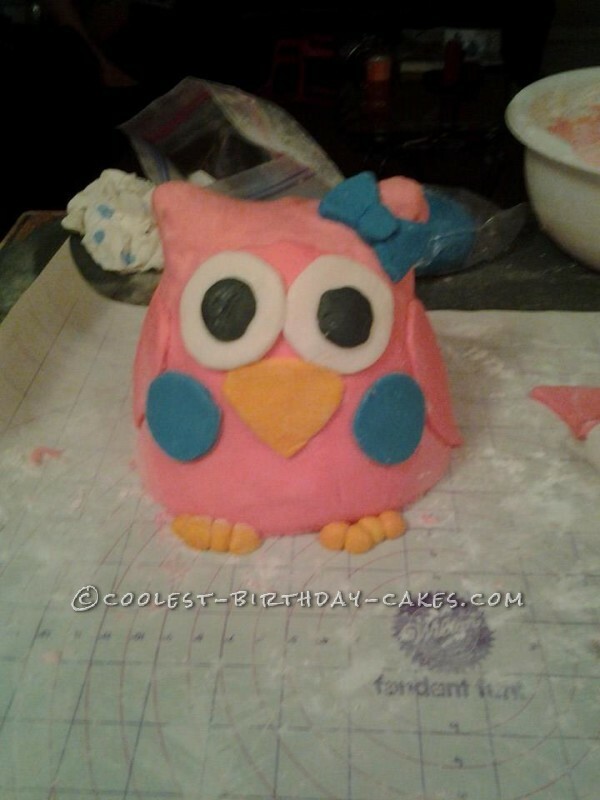 By this time the cake was cooled and I began to roll out the fondant to lay it over the cake. I smoothed it out and again I felt pretty proud. I then had to make flowers and letters out of the remaining fondant and get the icing ready for the final touches. It ended up taking several hours to make but at 2 a.m. I felt so proud and excited to have finished it. I also made some owl cake pops but they only took an hour to decorate 24 of them. So at 3a.m. or a little after I was ready for bed but I couldn’t sleep, I was worried about what everyone would think of my cake. At the party, everyone loved both the cake and the cake pops. They said it was just too cute to cut. That made my day. During the party, I had a woman come up to me and asked if I made cakes for a living. I laughed and said no this was my first and her expression was priceless. She asked if I wanted to make a cake for her next month. I had to tell her I was not sure because it took forever to make. I think I’ll just stick with family only for now. I had a blast making it but I believe I need practice before I do this for money. Maybe that will speed up the process. My soon-to-be 4-year old asked for a “Candy Cake” for his birthday. Sounded easy enough.